A few years ago, PSFK wrote about an emerging technology from Israeli company Lumus. 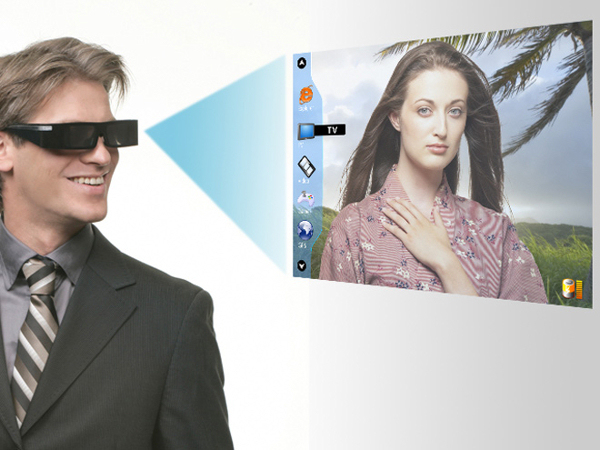 Now, they’ve released a new pair of glasses that lets the wearer view video content from the internet, movies and TV with their large, high-resolution virtual screen. The eyewear is see-through, providing simultaneous connectivity to what you want to watch and your surroundings. The glasses project an 87-inch screen about 10 feet in front of the wearer that can only be viewed by them, passers-by will just see a pair of unusual specs. The video image is overlayed onto reality, allowing them to watch without obscuring visibility. The glasses project a 720p image and a full-HD version is in the works. The lenses, which can be adjusted for those with poor eyesight, have a unique see-through display that allows for situational awareness while viewing content. So you can perform real-world tasks while watching TV, a movie, browsing the internet, playing a video game, viewing GPS information or checking your emails. When you turn them off, the picture disappears completely, and you can use them just like normal glasses.